Authentic looking Daisy Girl Scout 18" doll 8 piece uniform and accessory bundle! 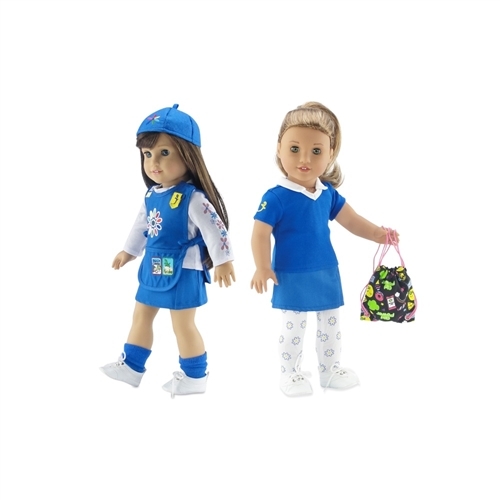 Mix and match items from your Daisy Scout uniform and accessory bundle and take your doll with you to your next scouting meeting or event! 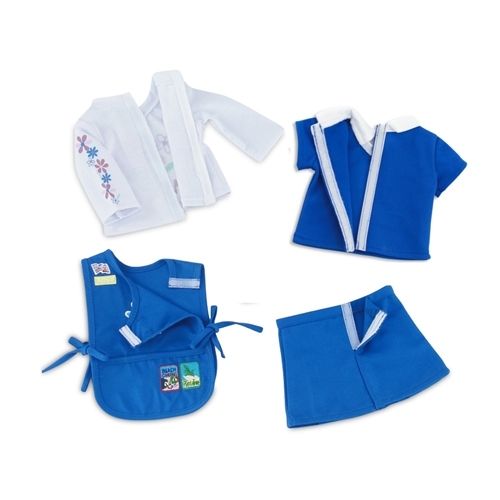 Bundle includes a 5 piece Daisy Scout uniform, including a bright blue pleated skirt and matching tunic with 5 colorful embroidered patches and removable insignia tab, a one of a kind long sleeved tee-shirt with daisy flowers, a bright blue matching beanie style hat with embroidered flower, and matching blue socks. But that's not all! 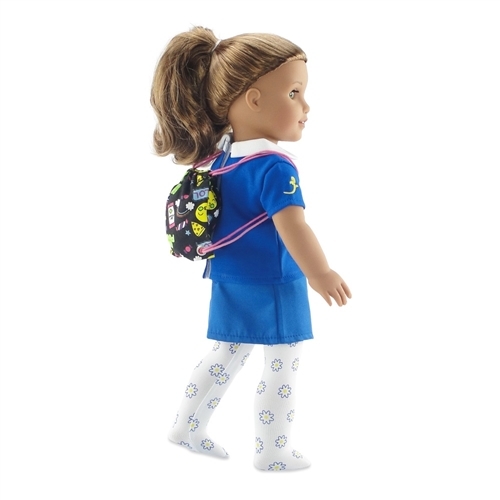 This amazing VALUE pack also includes mix and match items; a bright blue short sleeve activity shirt, with embroidered Emily Rose logo flower, a pair of white tights with yellow and blue daisy flowers, and a colorful "Girl Power" backpack. Both shirts and skirt feature our no-grab Velcro, making getting dressed a snap! 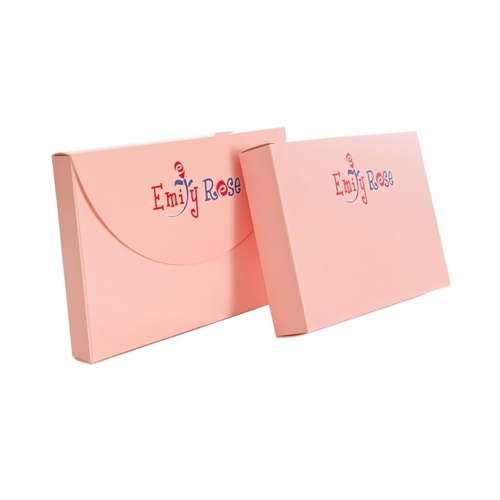 This awesome doll uniform and accessory bundle comes packaged in our special pink Emily Rose gift box and is a great addition to your 18 inch doll's wardrobe! 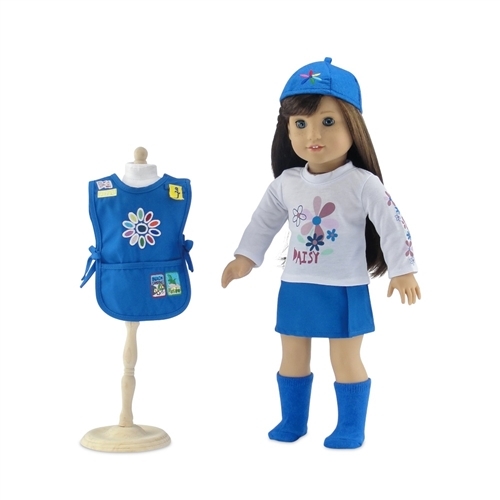 Bundle includes 5 piece Daisy uniform, including tunic with real embroidered patches, long sleeve shirt with Daisy graphics, blue socks and matching beanie style hat. Bundle also includes a 3 piece, mix and match clothing accessory pack, including a matching activity shirt with embroidered Emily Rose logo flower, a pair of tights with beautiful yellow and blue daisy flowers, and an amazing "Girl Power" themed backpack!